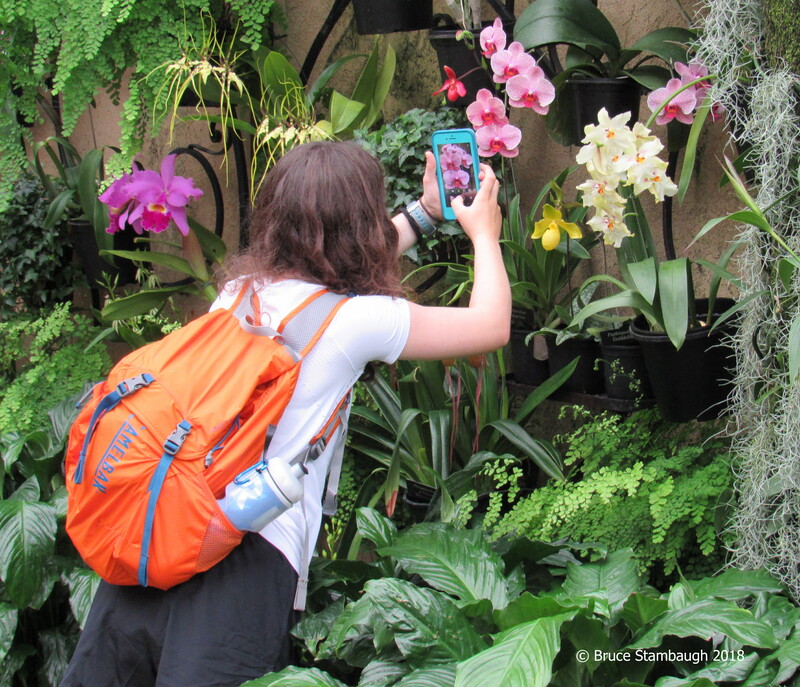 I was intrigued by this teenager’s keen interest in photographing the beautiful flowers at Longwood Gardens in Kennet Square, Pennsylvania. We kept running into one another as we wound our way through the many colorful displays of flowers, pools, fountains, and outdoor gardens. From my long-lived experience as a father, grandfather, teacher, and school principal, photography wasn’t a top priority for most teenagers. This young girl was the exception. After I took this shot of her capturing yet another lovely flower, I spoke with her parents, who stood at a distance, proudly admiring their daughter’s unabashed desire to photograph the gorgeous floral displays. I showed them this photo and identified myself as a retired principal. Curious, the girl came over to us and viewed my shot of her shot of the flower. She smiled, and I showed her another shot I had taken nearby of a glass ceiling with steel girders. She liked it, so I answered a question she didn’t ask but was on her face. I had taken the abstract-looking photo while others were busy observing the apparent displays all around them. I looked up. Next week, my Photo of the Week will be an example of that ditty of advice. For now, “Young Photographer” is my Photo of the Week. Heartwarming to see a young mind at work. And using their phone for a creative endeavour. I am sure your words of encouragement and sound advice will long be remembered. Yes, it was heartwarming, Gail, which is why I took the risk of approaching her parents. They were quietly appreciative of my comments, much the way they let their daughter explore and roam, lovingly hovering in the background.